ROCK bands, Darth Vader and his Imperial Stormtroopers, a variety of holiday attractions and kind-hearted hoteliers have joined up to a scheme helping seriously ill youngsters. 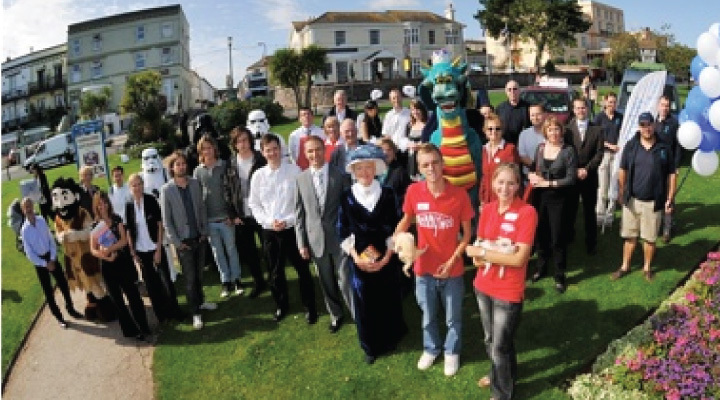 The Torbay Holiday Helpers Network was initiated by Luke Tillen, co-owner of the 27-room Hotel de la Mer in Babbacombe, Torquay, with the aim of providing free holidays for terminally ill children. Yesterday he met up with a whole host of hotels and attractions which have joined the scheme so children and their families can enjoy a week to remember. Since its June launch was highlighted in the Herald Express, about 50 organisations have signed up to Torbay Holiday Helpers Network. To make it work even more smoothly, Luke is giving families free passes to attractions so they can gain easy access to holiday activities. Matej Bendzala, of Babbacombe, who designed the Torbay Holiday Helpers Network attraction passes and website, said: ‘It was very good to be asked to be part of this. Among the more unusual attractions to sign up to the Torbay Holiday Helpers Network was Devon band The Days. They are signed to Atlantic Records and have supported the likes of Supergrass, Paolo Nutini and Scouting For Girls. Among the other groups to sign up is Garrison UK, whose Imperial Stormtroopers came down from the Midlands yesterday, keen to visit any youngsters benefiting from the scheme. Another company was Woodlands theme park, in the South Hams.